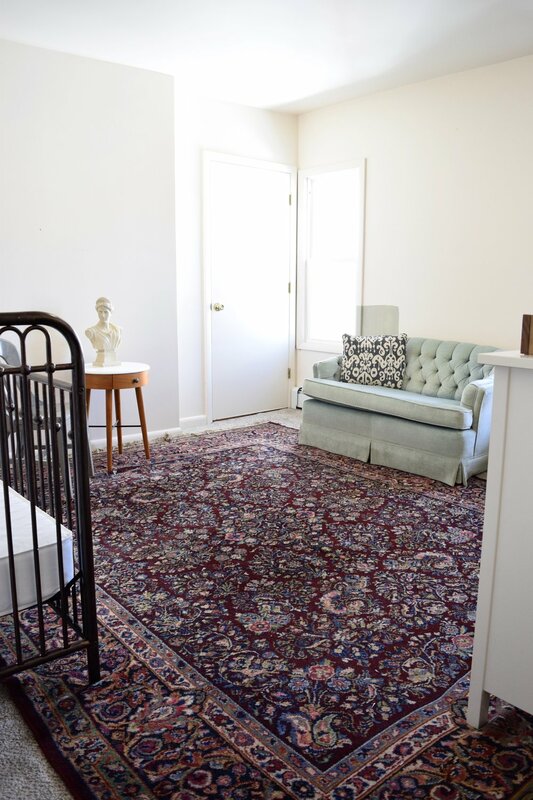 The Nursery | Progress Update #1 — Stevie Storck Design Co.
As I mentioned in my nursery design inspiration post, I want this room to feel elegant, collected and fairly gender-neutral. 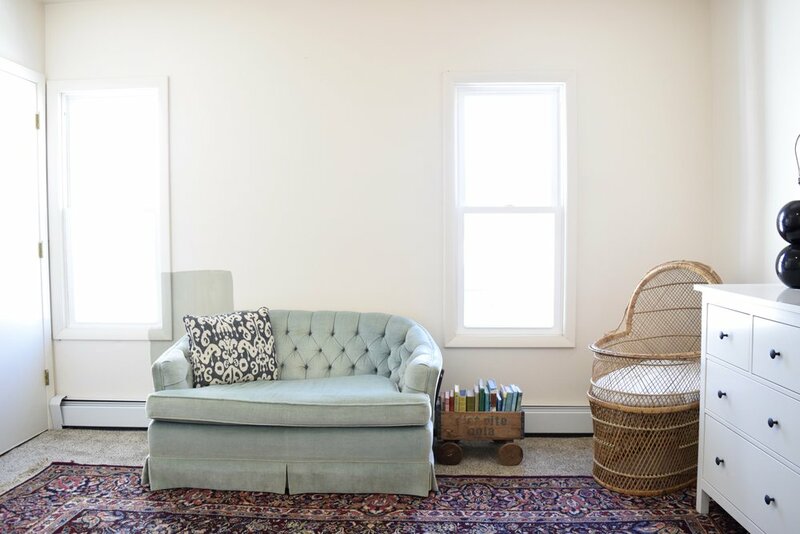 The overall design of the nursery will be classic, traditional and a little country but I want to contrast that with some simple, modern accents to keep if feeling fresh. For me that aesthetic starts with the crib. It has the look of an antique wrought iron crib but the simplified design makes it feel new and updated to me. Thank you to my mom for gifting the crib to us! This wooden chair is just a stand-in for now. We're looking to get a skirted swivel glider like the one in the collage above. I know skirts are super traditional, but I prefer them on swivel chairs because they hide the mechanism underneath. I think the neutral solid fabric and clean lines of this chair keep it from feeling too stuffy. And yes, I would plan to give it a good coat of Scotchguard to resist stains! But really, I'm not too picky about that kind of stuff. Homes are meant to be lived in and furniture is meant to be used. With kids and pets, there are bound to be accidents but my MO is if a good spot clean doesn't do the trick, there are a lot of sins that a well placed throw blanket or pillow can hide. 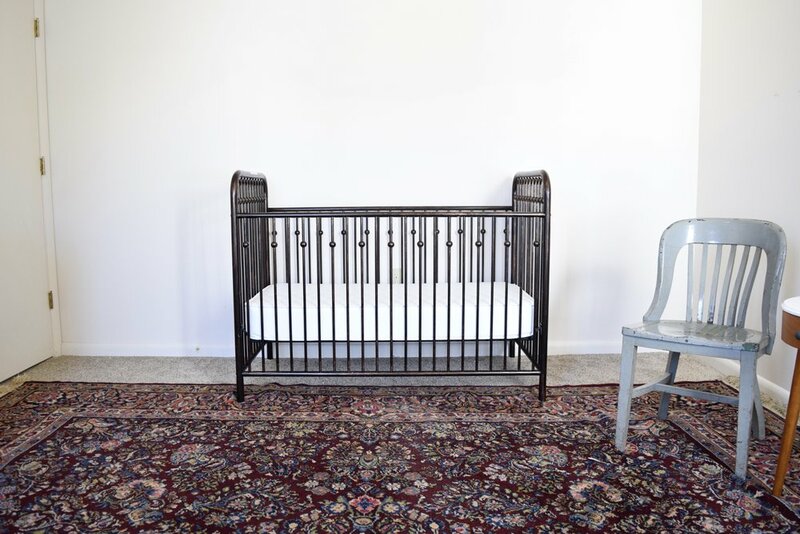 The rattan bassinet was a lucky vintage find that will live in our master bedroom for the first several weeks, but we're storing it here in the nursery for now. The IKEA dresser was purchased for our last apartment and we got this changing pad tray so it can pull double duty. Until we get the changing pad to go inside of it, it's corralling some art options I've been collecting for the space. Behind the velvet settee, you can see a swatch I've painted of the new wall color, French Grey by Farrow & Ball. In our house, I've been mostly drawn to super dark or super light colors so I wanted to challenge myself to use more of a mid-tone in this room. I love that French Grey really feels like an understated sage green and in person, it picks up on the shadows of the settee for a pretty tone-on-tone effect. I also love how it contrasts the warm burgundy background of the rug -- another secondhand find which I think totally makes the space! Another project I've been working on is her closet. In my last nursery post, I talked about the challenges of this odd closet with no rod or shelving and three big steps that traverse the slope of the staircase ceiling below. I was originally planning to put a metal closet organization system in just the part of the closet that's reachable from the door but that would have made it really hard to access the step area that off to the left. After a lot of brainstorming, I decided to leave the main part of the closet open and focus the storage above the top step. I still plan to make a cushion for the step below to make a fun little hideout for her to play or read in when she gets older. I have some more ideas for how to utilize the other walls for storage but we need to finish painting first! As you can see, I've collected and been gifted quite a bit of clothing already so I was super motivated to get this project started. I painted the ceiling and walls just around where the rod and shelving would go, but I'm leaving the rest for Anthony. The wood shelf will be painted white too, but I couldn't wait to put it up and see how it looked with all the bins. After that, we'll be ready for paint and the room will really start coming together! I'm really enjoying preparing this room for our little girl, although I admit I've spent way too much time thinking and over-thinking through every design decision. This room is probably the most important and meaningful room I've ever done, so it's definitely a labor of love!